Shredded chicken tostadas taste great and are a perfect Mexican dish to serve for dinner. These tostadas do require a bit of work but the end result is well worth it. 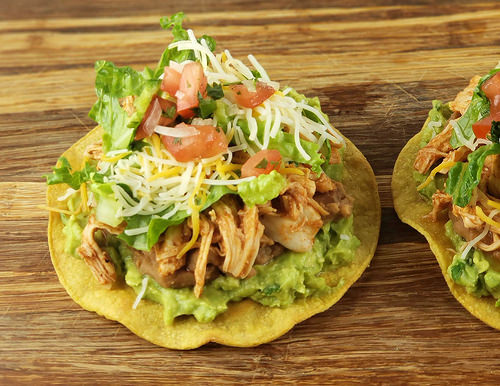 The tostada shells are made from corn tortillas, and topped with shredded Mexican chicken, guacamole, refried beans, pico, lettuce and cheese. You can save a lot of time by purchasing premade guacamole and pico. You can also purchase tostada shells if you want but making your own tastes so much better. You can add any of your favorite Mexican ingredients to this recipe. Enjoy. In a medium bowl combine tomato sauce, vinegar, garlic, chili powder, cumin, oregano, sugar, salt, and pepper. Heat the oil in a large skillet over medium-high heat. Add the chicken breasts and cook for 3 minutes on one side, flip and cook for 3 minutes on the other side. Add the tomato sauce mixture and bring to a boil. Reduce heat and simmer, covered, for about 20 minutes or until the chicken is cooked through (the internal temperature has reached 165 degrees F). Transfer the chicken to a cutting board and shred using two forks. Return the chicken to the pan with the sauce and continue to cook for about 5 more minutes. To make the pico de gallo- In a bowl combine plum tomatoes, onion, peppers and cilantro. Add the lime juice and salt. Mix well. Cover and refrigerate for 1 hour. To prepare tostada shells- Pre-heat the oven to 375 degrees F. Spray tortillas on both sides with cooking spray and place onto a baking sheet. Place into the oven and bake turning once for 10 minutes or until crispy and light brown. Spread a layer of guacamole on each tostada shell, followed by a layer to refried beans. Add some of the shredded chicken and top with lettuce, cheese, and pico de gallo.